Once again, it's fairly quick, involves no special trickery and uses simple ingredients. The longest part is cooking the rice, so it's best to start that off first. The quantities below will easily feed 3-4 people and cooking time is around 90 minutes. 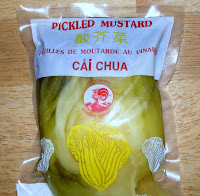 First a quick word about the pickled mustard leaves. These can be found in many oriental stores (Raan Thai sells it online) and only cost about £1 or less for a big packet. They're very sour, but a good match for this dish. They're not vital, Mrs K usually substitutes pickled onions and/or pickled gherkins - so choose whatever you prefer. Put a litre of water in a large saucepan and bring to the boil. Put the washed rice in and simmer vigorously and stir regularly until perhaps half of the water has been absorbed. Add another litre of boiling water plus a dessert spoon of butter (or margarine) and a bay leaf and simmer vigorously until half of that has been absorbed too. Add another half a litre of water then keep stirring occasionally to prevent the rice sticking - the overall objective is to keep the water level topped up all during cooking . The rice will start to thicken up a bit after 30-40 minutes, but keep cooking it for about an hour total until the consistency is like thick porridge. The exact consistency is a matter of taste - Mrs K likes it not too thick and not too runny. It should slide easily off the spoon with a bit sticking to the spoon . We suggest you cook the sauce first, then the rice, unless you're capable of multi-tasking - the sauce can easily be warmed up if needed. 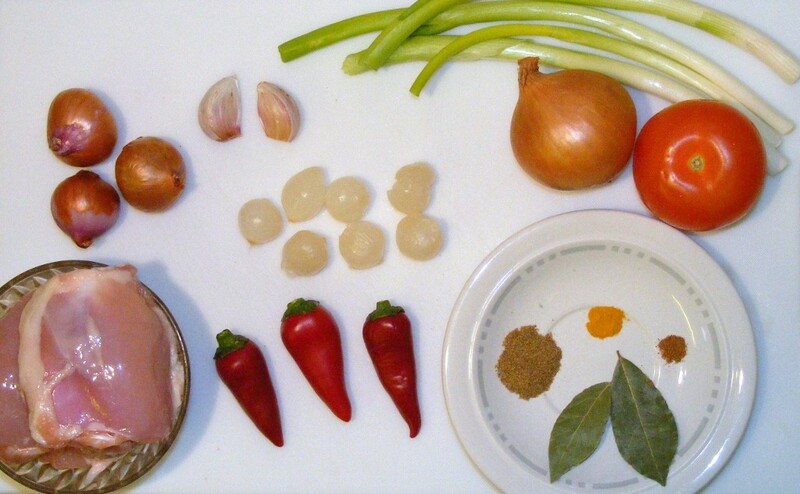 Chop the chicken meat into small pieces - about half-centimetre chunks is about right. 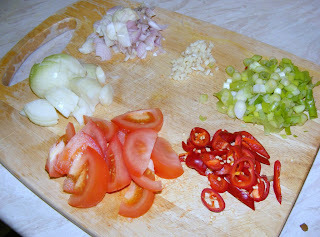 Chop the garlic finely, the spring onions, onion, chillies and shallots coarsely. Slice the tomato - the picture below gives an idea. Put the cooking oil (doesn't matter what kind - Mrs K uses sunflower oil) into a large frying pan and heat on a medium heat. Put in the shallots and when they've softened nicely add the onion. Fry for a few minutes until they're all soft but not browned. Add the garlic and chillies, stir in well for a minute or so before adding the tomato, coriander, nutmeg, turmeric and bay leaf. Now add the chicken, mix in well and cook for 8-10 minutes or until the meat is nicely brown (but not burnt). Add the dark and sweet soy sauce and mix. Add the spring onions, mix in then add half a glass of water and crumble in a chicken stock cube plus half a dessert spoon of salt. Simmer for another 3-4 minutes and its done. The sauce should be fairly thick and sticky, not watery. 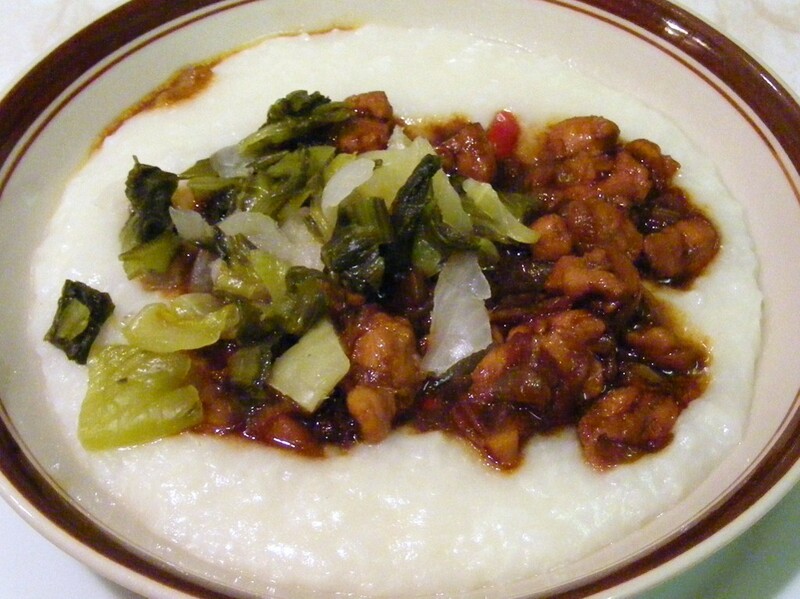 To serve, fill a bowl with rice, add a few spoonfuls of sauce then put chopped pickles to taste on top as a garnish. One variation is to cook the dish without the chicken, but garnish it with strips of cooked (fried or roast) chicken when serving. The video clip below shows Mrs K serving it, and gives a good idea of the consistency of the rice porridge. I made this for my boyfriend this morning! ABSOLUTELY DELICIOUS! Thank you for posting this recipe! !